My life, under the microscope...: Rakkasah! Whee! What a weekend! :-) It was kind of a blur... but in a good way. *note* I will add more photos as I get them from people, I don't have much right now. "A" and I left town late Saturday morning and drove to Vallejo for the Rakkasah festival. It was in a new location this year, with two full stages and two buildings. It was nice that it seemed a little more spread out, more room to walk around, but there needed to be a lot more seating! 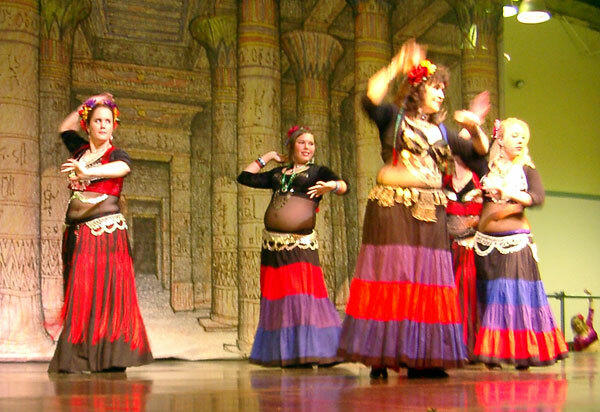 We spent a couple hours looking around at everything and buying a few things (I got a super cute t-shirt emblazoned with the word "bellydancer" and you'd better believe I'll wear it in public, and also a tie-front top for costume) and then we watched a bunch of performances. There are a lot of different styles of dance, and it was neat to see everyone's interpretation and costumes. There's also quite a range of talents, and that I must say is something of an ego boost, being rather much a "newbie" myself. It is also refreshing, if not downright empowering, to see women (and men! not many men though) of ALL shapes and sizes dancing. Kinda makes me feel pretty. 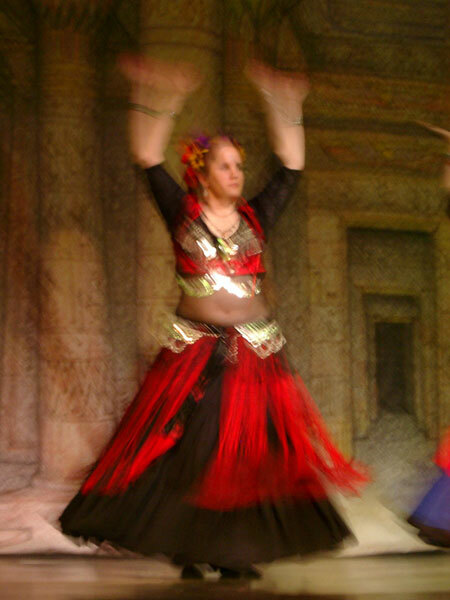 :-) Though mainstream culture seems to worship the ultra-thin, it isn't so in bellydance, where curves are actually a good thing! Anyway, we took off a little after 4 to start getting ready, which takes a LONG time (hair, makeup, complicated outfit, flowers, etc). Met up with the troupe in the hotel lobby at 6:30 and headed back to the fairgrounds. This was the first time they had seen the outfits I designed/sewed, so that was pretty neat, I got a lot of compliments on those and I must say we really looked fabulous. We hung out backstage for a while, and time flew, and we were all standing there gabbing thinking we had a while yet to go when suddenly they announced us and our intro music started and we all said something along the lines of "oh crap!" and ran to the stairs and onto the stage. It was a chaotic start, but no biggie. The performance was 15 minutes long, consisting of 6 dances (well, technically an intro, 4 dances, a finale). I was in 4 of them. Nobody was in all of them. It was a blur. What seemed to take so long in practice absolutely flew, and there really was no time to think about what was next or anything. I did pretty good, I think, I mean at least as far as not forgetting stuff. I missed one beat of one step. I probably did not smile the whole time, in fact I know I didn't. Hopefully I didn't look awful though. I'm just not a very smiley person but I tried. :-) I was nervous but not really all that bad, and nothing like that solo I did in January where I was shaking like a leaf. I'm glad a few people were there who knew me. My mom was there, and A's parents and husband, and CS, AS, and JG. And to my complete amazement so were JJ and CM! I was doing this move with both arms outstretched, looking at the audience thinking "gee I wish JJ could be here--OMG there she is in the front row!" I know I looked shocked and did a little wave and immediately realized that would show on the video, oops! Tee hee. For those of you who missed it, there will be more. I don't know any upcoming dates at this point but I'll be sure to pass them along. I can't wait for the next performance! It took me a while to figure out what I'm doing in this pic, because it's an odd position for my arms, but then I realized this is when I'm doing what we call the "wave step" in one dance.